Hello all! 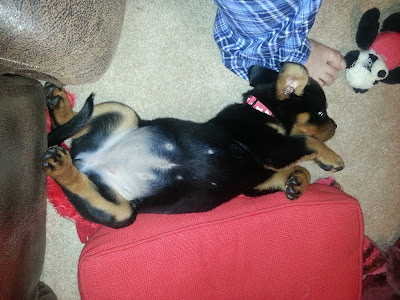 Just a quick post today before I hit the road. 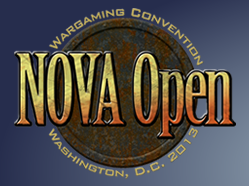 I leave tonight for NOVA, though I will be spending tomorrow working and enjoying some sights with family. 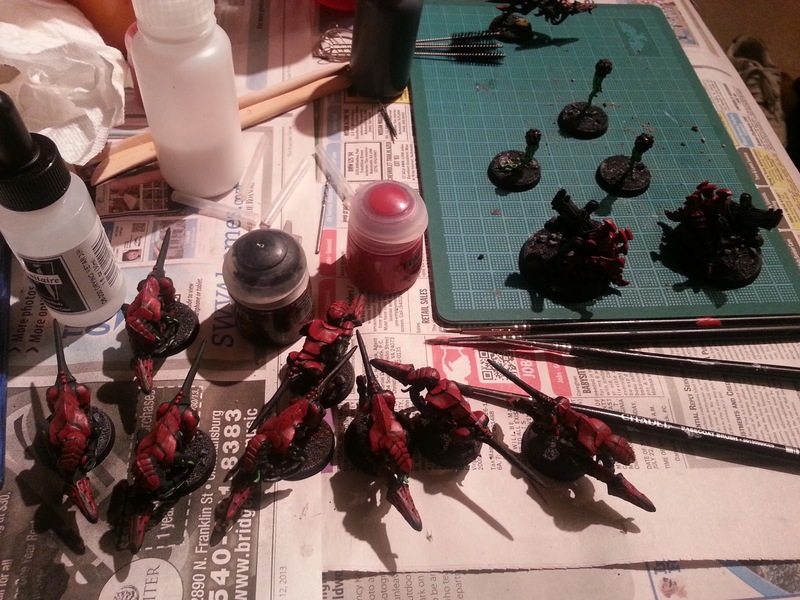 As such, I wrapped up my efforts for getting my full 1,850 point army together. The last weekend before NOVA has come and gone and I accomplished nothing. Not a single thing. I went out of town, leaving Friday immediately from work and arriving late last night. That said, this wasn't a surprise and has been incorporated into my planning. I will also be leaving for the DC area on Wednesday evening, and so, expect to have only tonight and tomorrow night to work on finishing up. Tuesday might be a late night. 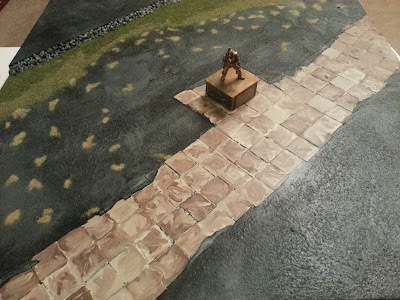 Before leaving town, I did get a bit more done on the board, namely the pathway and plinth, which was then secured in its spot. Inevitably, in every game I forget to perform an action in the correct order. Now, in friendly games, opponents often allows you to go back and perform the action if it's within reason. The problem with that is that it doesn't make you learn a lesson, so you'll forget to do X before Y again. In a tournament setting, I don't want to forget something, and I'm not going to ask forgiveness for forgetting something and doing it out of order. I would be reasonable with my opponent, but I'm not going to expect over-kindness if I forget to cast Iron Arm on a monstrous creature. As such, I've decided to put together a turn checklist, trying to call out steps I often forget. Now, keep in mind that this is tailored to NOVA and my list, so I've included some specifics to me. That said, feel free to use this list, and point out things I may have missed or just gotten plain wrong. Just a small update from last night. 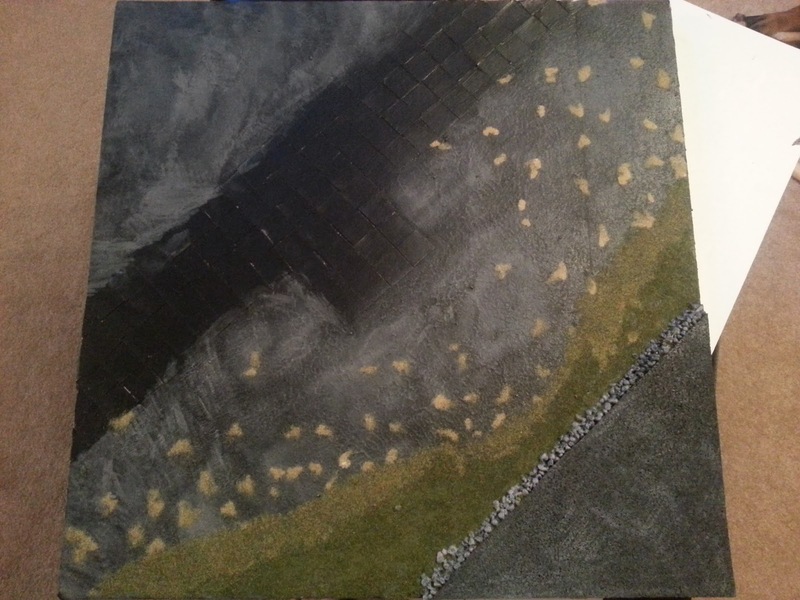 I didn't take too many pictures of the early stages, in part because it was tedious and boring; namely, drybrushing nearly 4 square feet of black paint with grey paint. In the end it's fairly patchy and I'm not all that happy with it yet. I then went about applying my static grass. I started with a band of green bordering the road, which gives way to a thin band of green and brown, followed by many patches of brown. Last night I got started on my display board. 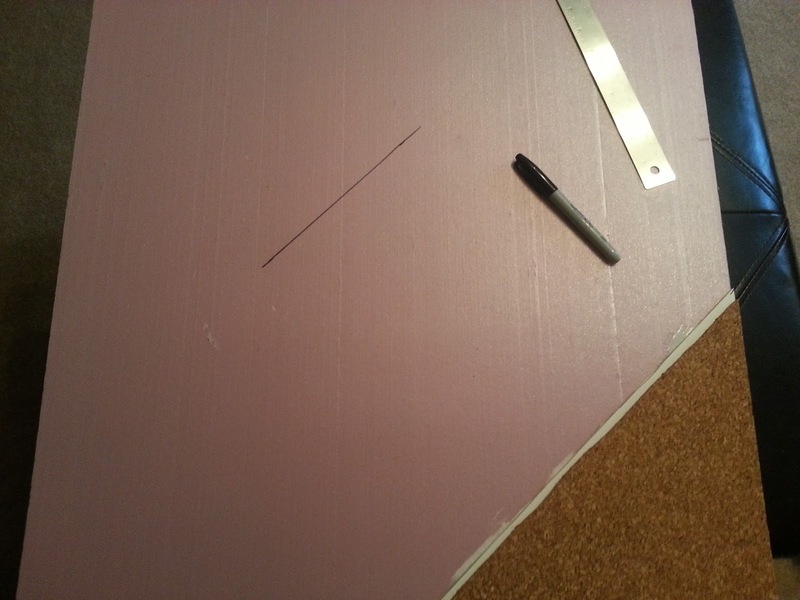 To boil down my pretty terrible clip-art shape sketch, the plan is to have the Mawloc's road in one corner at an angle, with a tiled path set back from the road which my Tervigon, Trygon, and Flyrant will be crossing. The road will be bordered by green grass that is quickly dying before the advance of the Swarmlord. On to the project! 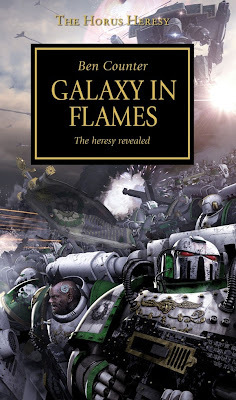 Like with Book 2, I bought Galaxy in Flames immediately after finishing False Gods (review here) and started reading just about straight-away. This novel more or less ties up the first trilogy that started with Horus Rising (review here). As with previous reviews, I'll try to avoid spoilers, but this one might make it tougher; at this point there's no way to avoid mentioning some events of Book 1 and 2, so if you haven't read them yet, maybe wait until you have. My productivity this weekend surprised myself. I can now see the light at the end of the tunnel. 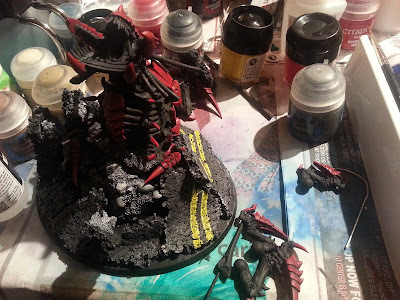 Most importantly, I finished the Mawloc conversion that has been scattering around in my head for nearly a year. 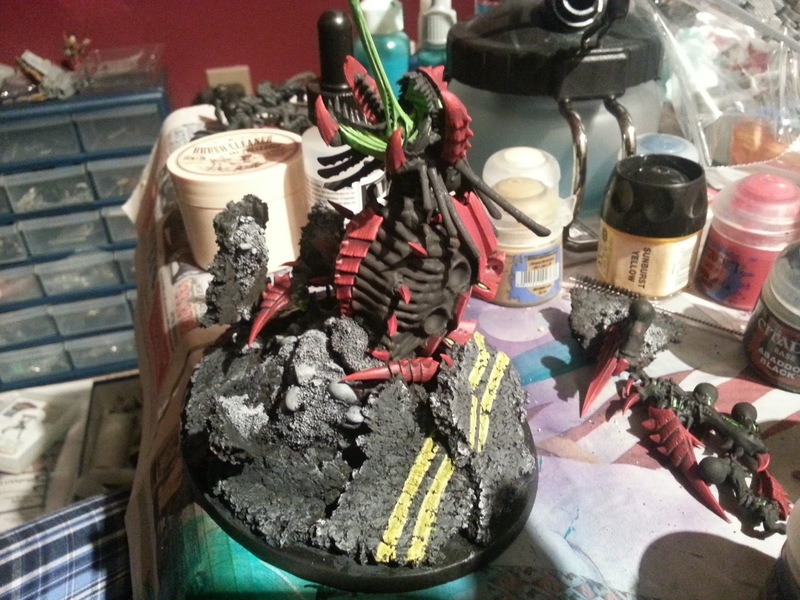 This weekend I finally finished my Mawloc. I'll go into the final details after the fold, but first, a side by side comparison with a normal Trygon. As you can see, despite not using a tail, with the Space Marine victim, he's actually taller than a normal version. 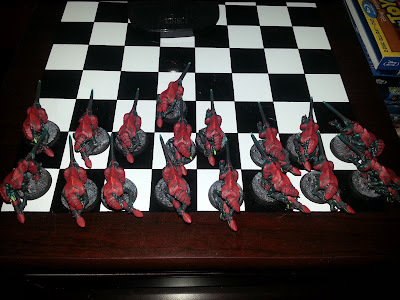 As +Chandler D mentioned in his post yesterday, I asked him to put together a Nid-Killer list to give me a prep game against a worst-case scenario list, as much as possible. 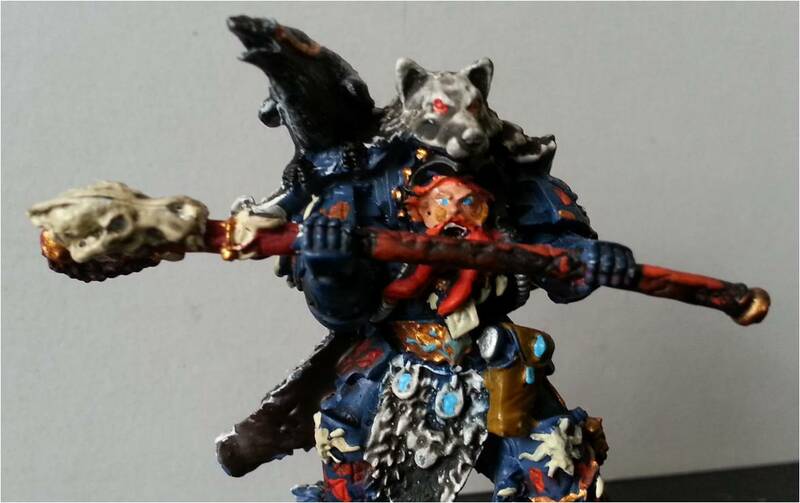 While Space Wolves are no longer exactly a top tier army in the tournament scene, I was hoping facing a fairly tailored list would tilt the scale a bit more in their favor. We decided to roll randomly to determine which of the three lists Chandler would bring and wound up with List 1: Bug Zapper Armored List. +Evan S came to me the other night with a very interesting request. As you all know he is prepping for NOVA and he wanted to have some practice. So I agreed to put together a few lists to challenge his Mighty Bugs. I figured for all bugs they hate three things: Blasts, Templates, and Armored Vehicles. 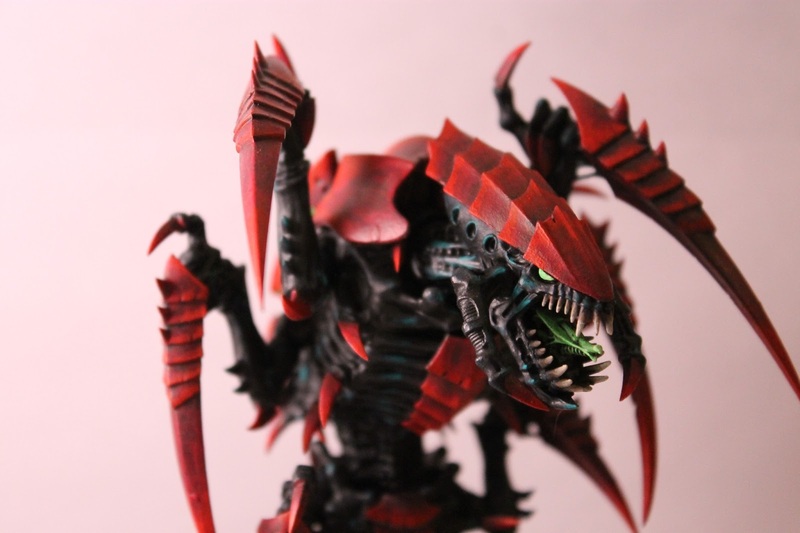 With that in mind, I created three Bug Killer Lists to take on the Full Force of Evan's Tyrannids. I wanted to take a quick opportunity to plug a 40k forum started by Fritz a few months ago: http://thewarmaster.com/index.php. 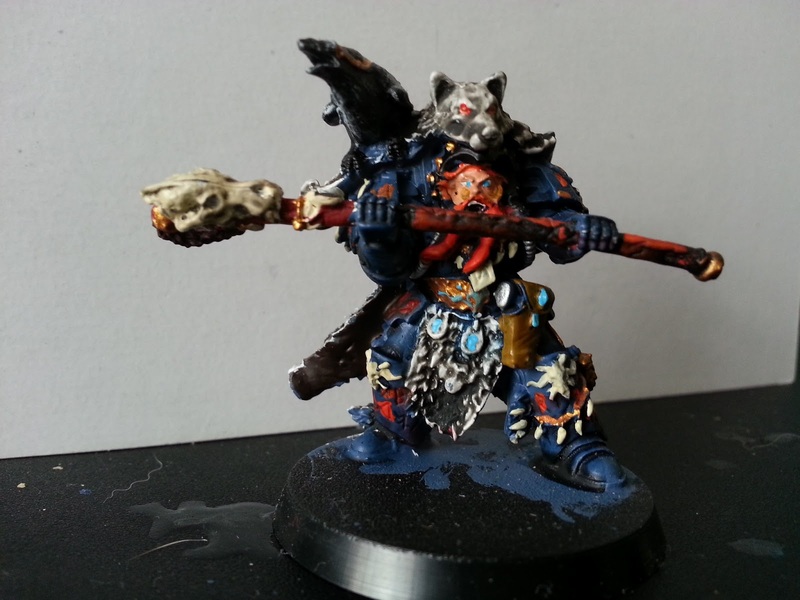 While the community is fairly small at the moment, I've really been enjoying the discussion in both Army Specific, General, and Hobby sections of the forum. Also,. there are some pretty good giveaways and contests each month, which is pretty awesome as well. So check it out. For today I only have a small painting update. 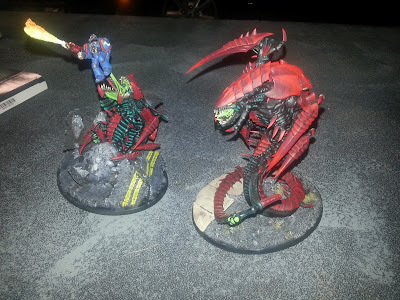 After the update I figure I will also address some of the Tyranid rumors floating around and weigh in a little. I'll start off by by announcing that I may have squealed like a little girl when I read Faeit's post this weekend with the rumor that Nids will get a new codex in November, not January. Ok, that might be an exaggeration, but I'm pretty sure I danced around a little. Then it set in that that would cut two months of saving/budgeting from my ability to purchase new releases. I am curious what new kits they'll get, but the only things I know for certain I'll be getting is the glorified dust jacket edition and possibly a second copy in either digital or regular edition, though the second version can wait. Not a huge need for budgeting just for those. I thought I would put together a mini update of rumors, releases, and hobby progress. My weekend began with these bad boys arriving from Moridian7th. These two models were more or less why I started following his blog in the first place, so I couldn't resist. Also, it's nice to know that I'm helping out a fellow hobbyist with my impulsive purchases. 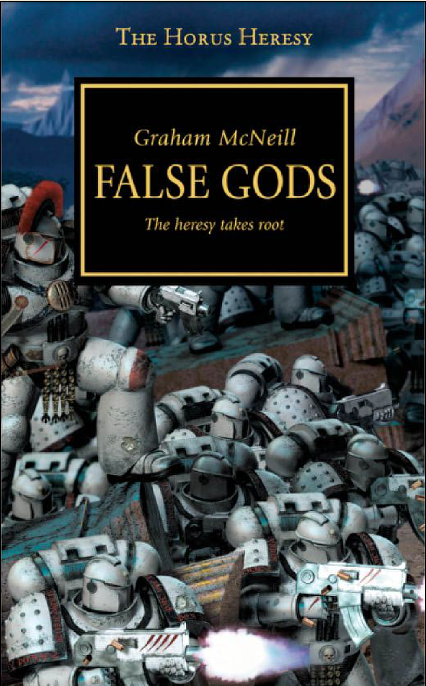 Once I finished Book 1 of the series I was hooked and immediately bought Book 2: False Gods, at around midnight on a weeknight. As with Horus Rising, the first line is a heck of a hook: "I was there the day that Horus fell..."
Fritz recently posed this question on his blog and forum (so all credit to him): what is more powerful, a group of Grots, or Terminators? 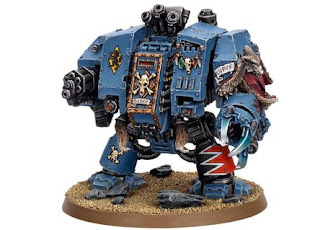 The crux of the argument stems from how to define "powerful" and that Grots, as troops who will be largely overlooked, are more likely to win games than Terminators. I decided to take this idea and look at my Tyranids; who are my Terminators? who are my Grots? It seems obvious, but part of why Fritz brought it up is because the obvious answers (like Terminators are more powerful) might not be as clear cut as you first think. 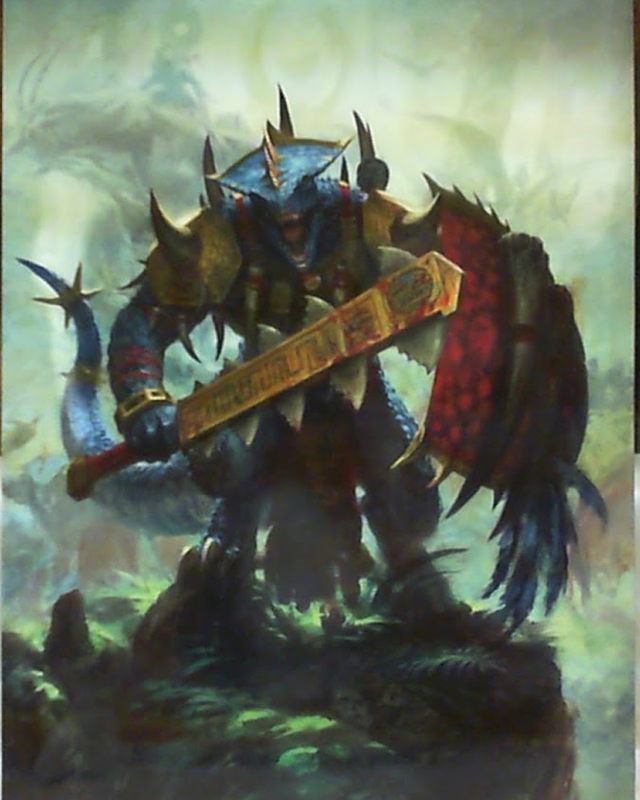 This last weekend saw the release of the servants of the Old Ones: The LIZARDMEN. 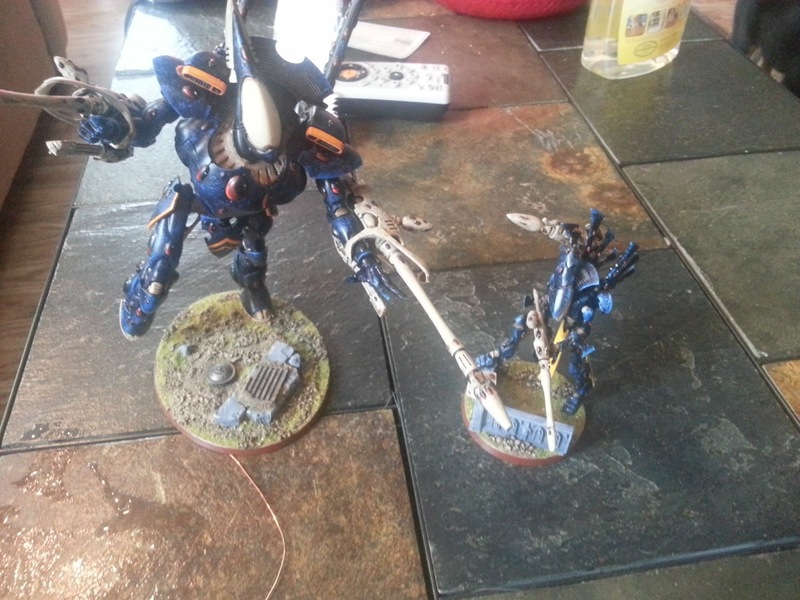 This is the only fantasy army that I play and as such I went all out and bought the Limited Edition Codex. I am thoroughly excited to get this codex, see what models and pictures are in there, and most importantly the new signature powers for the Priests. 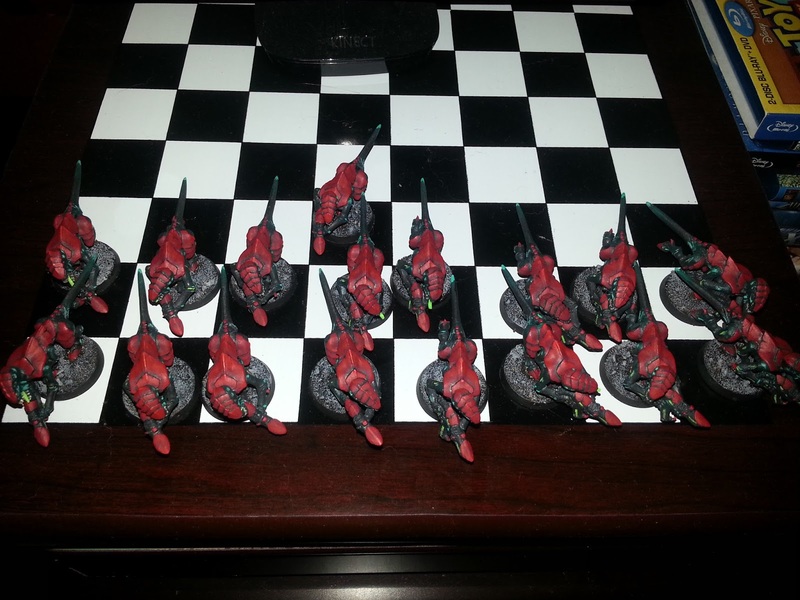 So without further interruption, I present Warhammer: Lizardmen. Between family visiting last weekend and a new puppy who has gotten a minor health problem, I've managed about 30 minutes at the gaming table. This was spent finishing the assembly of 10 hormagaunts and then moving forward on the basing for the Mawloc. 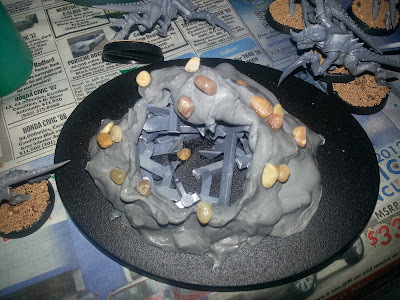 I started by using superglue to attach a few small pebbles in various places. 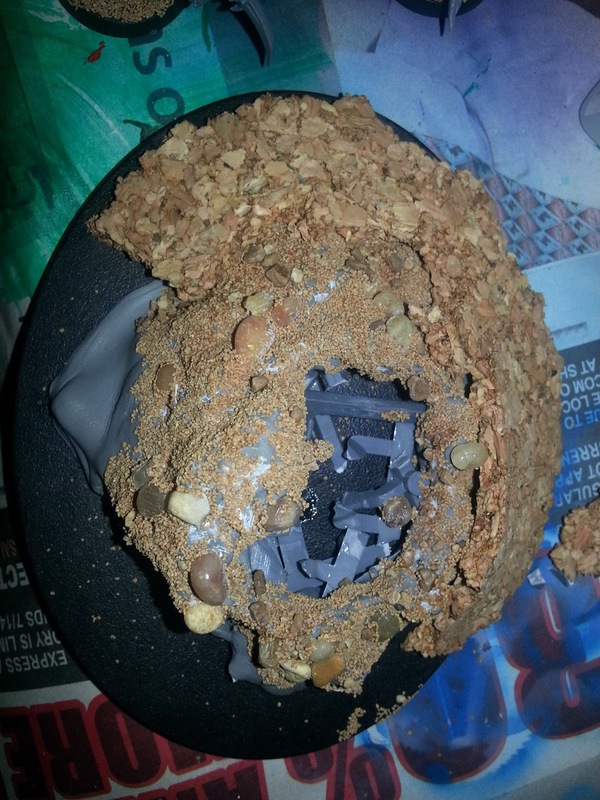 I followed that up with PVA glue for my typical sand. 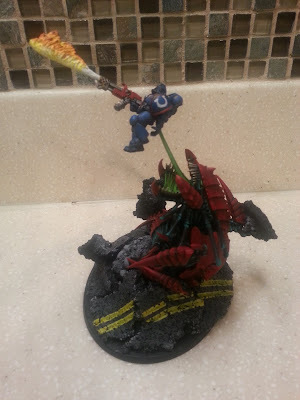 So yesterday, (Sunday), my friend John and I ventured to our LGS Fun N Games for their monthly Warhammer 40k Tournament. John has Orks at his home but here in Blacksburg, he's got nothing but us and +Evan S's armies; Evan set him up with an in your face Ork army, while I came there with 2 lists ready for hopefully a fun day. My Lists were basically the same with a few minor exceptions. I had one list that was a Monster Hunter list while the other was Bjorn making another appearance for the Wolves (Three Player Game). Upon arriving at the store I was greeted by a wonderful sight of 7 other players besides John and myself and a variety of armies, including Tau, Dark Angels, Tyranids, 2 Orks, Imperial Guard, Chaos Marines, Space Wolves, and another army that I can't recall. I was (un)lucky to draw Tau, Chaos Marines, and Imperial Guard. It was a fun day full of surprises. The final edition of the NOVA GT Primer was posted yesterday, and while the final FAQ won't be up until around August 6, I thought I would run through some thoughts and questions I had (any NOVA Veterans or Rules Lawyers please chime in). 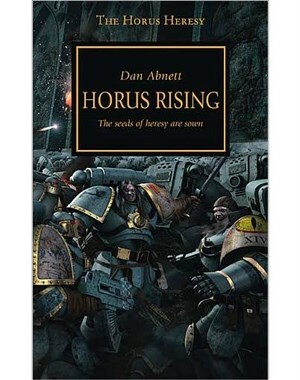 I know I am way behind the times, but the Horus Heresy books were first released in my time away from the hobby. I am an avid reader, but always found Black Library novels fairly hit or miss in terms of enjoyment, some being absolutely atrocious while others being fun. My interest in the Horus Heresy series was piqued when +Chandler D lent me a copy of the audio Prospero Burns to listen to at work. 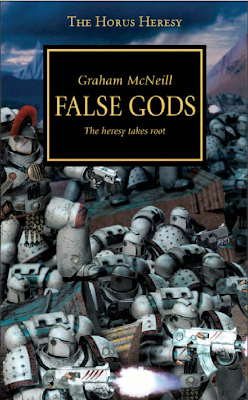 I was thoroughly impressed by scope and quality of the writing, pleasantly surprised to find that the novel not only went far beyond an action, hack and slash story, but that I enjoyed a Warhammer novel that couldn't be recreated on the table top. As I read through, I plan on doing short little reviews for anyone who is interested. I will do my best to avoid spoilers, which means the review may have to be fairly generic. I was sucked in, from the very first line, preceding even the first chapter: "I was there, the day Horus slew the Emperor..."